The number of dwarf planets in the Solar System is unknown. Estimates run as high as 200 in the Kuiper belt and over 10,000 in the region beyond. However, consideration of the surprisingly low densities of many dwarf-planet candidates suggests that the numbers may be much lower (e.g. at most 9 among bodies known so far). The International Astronomical Union (IAU) has accepted five: Ceres in the inner Solar System and four in the trans-Neptunian region: Pluto, Eris, Haumea, and Makemake, the last two accepted for naming purposes. In 2008, the IAU modified its naming procedures such that objects considered most likely to be dwarf planets receive differing treatment than others. Objects that have an absolute magnitude (H) less than +1, and hence a minimum diameter of 838 kilometres (521 mi) if the albedo is below 100%, are overseen by two naming committees, one for minor planets and one for planets. Once named, the objects are declared to be dwarf planets. Makemake and Haumea are the only objects to have proceeded through the naming process as presumed dwarf planets; currently there are no other bodies that meet this criterion. All other bodies are named by the minor-planet naming committee alone, and the IAU has not stated how or if they will be accepted as dwarf planets. Calculation of the diameter of Ixion depends on the albedo (the fraction of light that it reflects), which is currently unknown. The qualifying feature of a dwarf planet is that it "has sufficient mass for its self-gravity to overcome rigid-body forces so that it assumes a hydrostatic equilibrium (nearly round) shape". Current observations are generally insufficient for a direct determination as to whether a body meets this definition. Also, a dwarf planet may not be the satellite of another body, even though several moons (such as Titan) are larger than the recognized dwarf planets. Based on a comparison with the icy moons that have been visited by spacecraft, such as Mimas (round at 400 km in diameter) and Proteus (irregular at 410–440 km in diameter), Michael Brown estimated that an icy body relaxes into hydrostatic equilibrium at a diameter somewhere between 200 and 400 km. Ceres is thought to be the only dwarf planet in the asteroid belt. 4 Vesta, the second-most-massive asteroid, appears to have a fully differentiated interior and was therefore in equilibrium at some point in its history, but it is not today. The third-most massive object, 2 Pallas, has a somewhat irregular surface and is thought to have only a partially differentiated interior. Brown has estimated that, because rocky objects are more rigid than icy objects, rocky objects below 900 kilometres (560 mi) in diameter may not be in hydrostatic equilibrium and thus not dwarf planets. After Brown and Tancredi made their calculations, it was discovered that Iapetus (1,470 km in diameter) and the smaller moons of Saturn down to Mimas with well-determined shapes are not in hydrostatic equilibrium as had been thought. They have a hydrostatic shape that froze in some time ago and that does not match the shape an equilibrium body would have at their current rotation rates. Ceres, at 950 km, is the smallest body for which detailed measurements are consistent with hydrostatic equilibrium. It is not clear whether trans-Neptunian objects would behave more like Ceres or Iapetus; thus, some or all trans-Neptunian dwarf planets smaller than Pluto and Eris might not actually be in equilibrium. The IAU has not addressed the issue since these findings. In 2010, Gonzalo Tancredi presented a report to the IAU evaluating a list of 46 candidates for dwarf planet status based on light-curve-amplitude analysis and the assumption that the object was more than 450 kilometres (280 mi) in diameter. Some diameters are measured, some are best-fit estimates, and others use an assumed albedo of 0.10. Of these, he identified 15 as dwarf planets by his criteria (including the four accepted by the IAU), with another nine being considered possible. To be cautious, he advised the IAU to "officially" accept as dwarf planets the top three not yet accepted: Sedna, Orcus, and Quaoar. Although the IAU had anticipated Tancredi's recommendations, as of 2013, they have not responded. Source: Mike Brown, as of Jun 21, 2018. (Summary figures differ on M. Brown's website using a cumulative count). Mike Brown considers a large number of trans-Neptunian bodies, ranked by estimated size, to be "probably" dwarf planets. He did not consider asteroids, stating "In the asteroid belt Ceres, with a diameter of 900 km, is the only object large enough to be round". Near certainty: diameter estimated/measured to be over 900 kilometres (560 mi). Sufficient confidence to say these must be in hydrostatic equilibrium, even if predominantly rocky. Highly likely: diameter estimated/measured to be over 600 kilometres (370 mi). The size would have to be "grossly in error" or they would have to be primarily rocky to not be dwarf planets. Likely: diameter estimated/measured to be over 500 kilometres (310 mi). Uncertainties in measurement mean that some of these will be significantly smaller and thus doubtful. Probably: diameter estimated/measured to be over 400 kilometres (250 mi). Expected to be dwarf planets, if they are icy, and that figure is correct. Possibly: diameter estimated/measured to be over 200 kilometres (120 mi). Icy moons transition from a round to irregular shape in the 200–400 km range, suggesting that the same figure holds true for KBOs. Thus, some of these objects could be dwarf planets. Probably not: diameter estimated/measured to be under 200 km. No icy moon under 200 km is round, suggesting that the same is true for KBOs. The estimated size of these objects would have to be in error for them to be dwarf planets. Grundy et al. propose that dark, low-density TNOs in the size range of approximately 400–1000 km are transitional between smaller, porous (and thus low-density) bodies and larger, denser, brighter and geologically differentiated planetary bodies (such as dwarf planets). Bodies in this size range should have begun to collapse the interstitial spaces left over from their formation, but not fully, leaving some residual porosity. Many TNOs in the size range of 400–1000 km have oddly low densities, in the range of 1.0–1.2 g/cm3, that are substantially less than dwarf planets such as Pluto, which have densities closer to 2. Brown has suggested that large low-density bodies must be composed almost entirely of water ice, since he presumed that bodies of this size would necessarily be solid. However, this leaves unexplained why TNOs both larger than 1000 km and smaller than 400 km, and indeed comets, are composed of a substantial fraction of rock, leaving only this size range to be primarily icy. Experiments with water ice at the relevant pressures and temperatures suggest that substantial porosity could remain in this size range, and it is possibly that adding rock to the mix would further increase resistance to collapsing into a solid body. Bodies with internal porosity remaining from their formation could be at best only partially differentiated, in their deep interiors. (If a body had begun to collapse into a solid body, there should be evidence in the form of fault systems from when its surface contracted.) The higher albedos of larger bodies is also evidence of full differentiation, as such bodies were presumably resurfaced with ice from their interiors. Grundy et al. propose therefore that mid-size, low-density and low-albedo (< ≈0.2) bodies such as Salacia, Varda, Gǃkúnǁʼhòmdímà and (55637) 2002 UX25 are not differentiated planetary bodies like Orcus, Quaoar and Charon. The boundary between the two populations would appear to be in the range of 900–1000 km. If correct, this would leave only Pluto–Charon, Eris, Haumea, 2007 OR10, Makemake, Quaoar, Orcus and high-albedo Sedna (but probably not low-albedo 2002 MS4) as dwarf planet candidates in the outer Solar System. The following trans-Neptunian objects have estimated diameters at least 300 kilometres (190 mi) and so may be dwarf planets. Not all bodies estimated to be this size are included. The list is complicated by bodies such as 47171 Lempo that were at first assumed to be large single objects but later discovered to be binary or triple systems of smaller bodies. The dwarf planet Ceres is added for comparison. The default sort is per Brown's size estimate. The IAU-recognised dwarf planets have bold names. Brown's diameter estimates are in red when they are based upon an assumed albedo. Explanations and sources for the measured masses and diameters can be found in the corresponding articles linked in column "Designation" of the table. ^ The measured diameter, else Brown's estimated diameter, else the diameter calculated from H using an assumed albedo of 8%. ^ Diameters with the text in red indicate that Brown's bot derived them from heuristically expected albedo. ^ This is the total system mass (including moons), except for Pluto and Ceres. ^ a b c Mike Brown. "The Dwarf Planets". Retrieved 2008-01-20. ^ Dan Bruton. "Conversion of Absolute Magnitude to Diameter for Minor Planets". Department of Physics & Astronomy (Stephen F. Austin State University). Archived from the original on 2010-03-23. Retrieved 2008-06-13. ^ "Dwarf Planets". NASA. Retrieved 2008-01-22. ^ "Plutoid chosen as name for Solar System objects like Pluto" (Press release). ^ Savage, Don; Jones, Tammy; Villard, Ray (1995-04-19). "Asteroid or Mini-Planet? Hubble Maps the Ancient Surface of Vesta". Hubble Site News Release STScI-1995-20. Retrieved 2006-10-17. ^ "Iapetus' peerless equatorial ridge". www.planetary.org. Retrieved 2 April 2018. ^ "DPS 2015: First reconnaissance of Ceres by Dawn". www.planetary.org. Retrieved 2 April 2018. ^ a b Tancredi, G. (2010). "Physical and dynamical characteristics of icy "dwarf planets" (plutoids)". Icy Bodies of the Solar System: Proceedings IAU Symposium No. 263, 2009. ^ a b c d Michael E. Brown. "How many dwarf planets are there in the outer solar system? (updates daily)". California Institute of Technology. Retrieved 2 June 2017. ^ "AstDys (47171) 1999TC36 Ephemerides". Department of Mathematics, University of Pisa, Italy. Retrieved 2009-12-07. 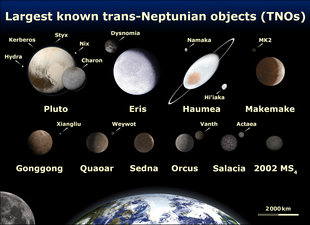 ^ "List Of Trans-Neptunian Objects". Minor Planet Center. ^ "List Of Centaurs and Scattered-Disk Objects". Minor Planet Center. Which are the Dwarfs in the Solar System? Tancredi, G.; Favre, S. Icarus, Volume 195, Issue 2, p. 851–862.